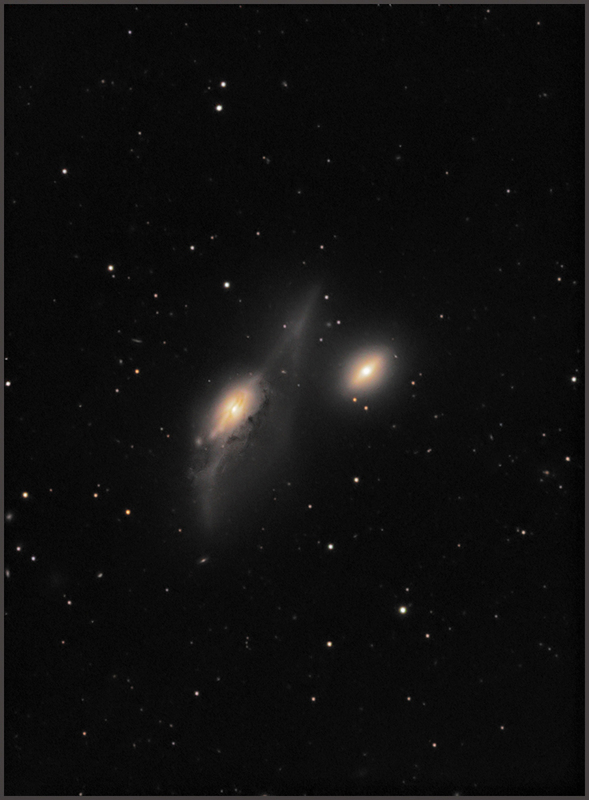 The 'Eyes' Galaxies (NGC 4435-NGC 4438, aka Arp 120) are about about 52 million light-years away. It's not known what the energy source is that is heating NGC 4438. It could be due to starburst origin or a Black Hole. These beautiful interacting galaxies are in the middle of a group of galaxies known as the 'Markarian Chain'. Hubble has taken some interesting shots of the core, and has seen globs of matter being ejected, which seem to be caused by collisions between the jets of material ejected at high speed from the poles of the black hole and the surrounding medium. It also looks like there may have been a collision between the galaxies in the distant past. Imaged on the 22nd & 23rd March 2009 from Weymouth. Luminance. 34 x 6 minutes. R,G & B, all 4 minutes binned 2x2. Flats and bias applied.